Tiaris is perfect for families or couples traveling together, because it’s within walking distance of the beach and has lots of space. The outdoor area is extravagant to say the least, with several different balconies, terraces, and tanning spots. 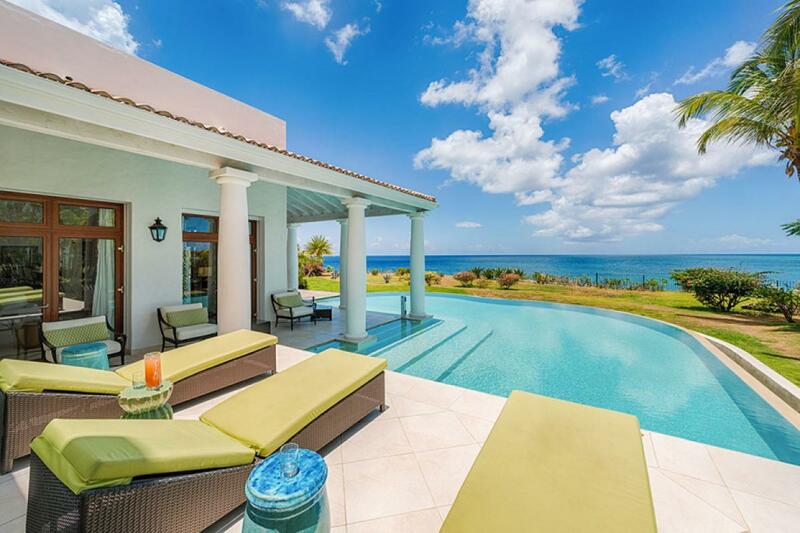 Tiaris Villa sits on a bluff over Baie Longue, with two levels of extravagant living space and four bedrooms. The ground level has a wraparound terrace with an infinity pool, and a covered terrace that lends shade to the outdoor area. Loungers and seating throughout give guests space to sunbathe or nap, and the al fresco dining space sits next to a gas grill. This space opens to the indoor dining area, study, and kitchen. The fully equipped kitchen has terrace access and stainless steel appliances. The living room opens to the wraparound terrace and has ocean views. Both bedrooms on this level feature king-sized beds, interior access, flat screen TVs, and ensuite baths. The upper level also has a spacious outdoor area, with several balconies and covered terraces. Additional dining space and loungers enhance the ocean view from the pergola and terraces. Inside, there’s a game room and two bedrooms, each with a king-sized bed, flat screen TV, and ensuite bath. Tiaris Villa guests have access to La Samanna’s tennis courts, fine dining, spa, swimming pools, and boutiques. The villa is located on Baie Longue beach, and Marigot is a 10 minute drive away. Additional guest can be accommodated with Rollaway beds which can be rented. Private butler upon request during high season at an hourly rate, minimum 2 hours required.